Motorola's Moto E 2nd Gen was an improved version of the E series launched by the illustrious phone market. It was a low end phone offering appealings aesthetics and features A modest phone to support all your daily smartphone tasks without any lags, the Moto E 2nd Gen was well received at the time of release. The Motorola Moto E 2nd Gen featured with a larger screen (as compared to the first generation model), stock Android Lollipop, and 3G adaptability. But with the smartphone market saturated with powerful smartphones at relatively low costs; the Moto E seems is fairly lacklustre. The camera quality is just passable with pictures lacking detail and selfies with grainy texture. The processor is now outdated as well. With no 4G capability, the phone is certainly obsolete. 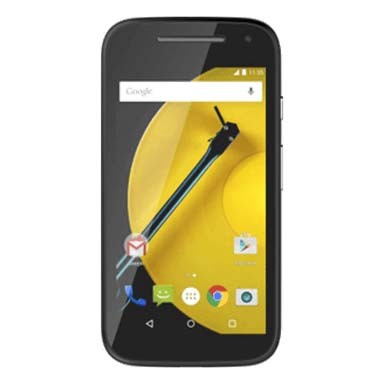 The Moto E, though sturdy, is not sufficient for the gizmo savvy users of today. If you think it is time for you to upgrade your smartphone to a new one and catch up with the latest tech, let Cashify take care of that for you while you seal the deal with a few clicks. For all those looking to sell their old phones before buying a new one, Cashify unlocks a simple yet lucrative way to sell their Moto E 2nd Gen. It is a trusted name with a repute of handling lakhs of transactions on old gadgets and mobile phones, and boast a patronage of over 9 lakh customers. It has also paired exclusively with brands such as Xiaomi, Motorola, Apple, Vivo, OnePlus, Croma, Amazon and many others. Follow these easy steps to sell old phone online with Cashify at your own convenience. 1. Select the name of your phone's brand and model name, Motorola Moto E in this situation, and answer a few questions about the current status of your phone and its physical condition. 2. Cashify's automatically generated pricing algorithm will provide you with a competent and transparent price. You can always fetch a good price for your Moto E at Cashify as it generates the price after taking into consideration the current price and your responses. 3. Once satisfied with the price, arrange a free pickup with Cashify at a place that suits you and at a time of your preference. 4.The representative will contact you and the payment will be done instantly in exchange of the old phone. You are free to choose the mode of payment as well. Set aside all your worries and let Cashify give you a hassle free experience of selling your old Moto E at the best suited price. Cashify is the leading platform in India to sell mobile phones and other gadgets online for instant cash on pickup. Get your used mobile off your hand.